We have more than a decade of experiences in desktop virtualization. Contact us for assistance with setting up your own virtual environments. Storage virtualization - stop worrying about running out of hard disk space, just another disk. Wish we had (e.g.) ZFS file system on every desktop. List of computer system emulators - a quite interesting overview! 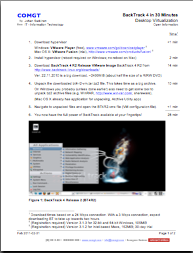 Create your own virtual machine or find ready-to-use applicances? Do you have the proper hardware and software (host OS)? Also - don't forget that you may need to download and install additional tools for downloading and unpacking files. On Mac: some tool for handling torrent files may be required. Some distributions, especially Linux, are distributed over peer-to-peer (P2P) networks. Where to store files, virtual machines/appliances? These can take up serious space on hard disks. Keeping track on where stored! In our case with lots of machines, for Parallels, VMware, and VirtualBox it's critical to keep track on all files. Backups! This definitely needs some considerations - see Backups below for more. This is of course very much an opinion and your personal requirements and needs will ultimately determine what is your perfect host. Traditional HD for data. More below under SSD and Traditional Hard Drives. Mac OS 7-9 (add) - Mac: see (e.g.) sheepshaver.cebix.net for running older Mac OSs. BSD-env. (std) - Mac: underlying technology (kernel and terminal, command line interface (CLI), commands) is BSD-based. Add BSD-subsystem (on system disk that comes along the computer) for also development, building sources, etc. We actually strongly recommend staying with Windows XP as host OS for Windows-based host machines - and stay away from Windows 7. I.e. - at least if going for 64-bit variants, which you most like would. You want as much memory you can afford. Windows 7 64-bit is a big operating system - requires significant hard drive space and RAM just to run the OS. Drivers MUST be signed drivers - in general not a bad thing, but can create problems. More on different variants of Windows 7 at jandp.biz/is/sw/mswin/#Windows7. Quite sufficient for a host OS - GUI additions etc in Windows 7 are a waste of space, resources. If you really want Windows 7, run the 32-bit (or 64-bit) in a virtual machine. Mac OS X 10.6 Snow Leopard 5 GB 1 GB One main goal w/ 10.6 was optimizing size and speed. Cygwin (No need*) Yes n/a Linux environment for Windows. Pros "Runs Windows and other operating systems on the OS X desktop. Tight integration of Windows apps with OS X. Fast performance. Many options for importing an existing Windows system." "Runs Windows and other operating systems on the OS X desktop. Tight integration of Windows apps with OS X. Low-clutter, customizable integration between Windows and OS X. Works well with legacy applications under Windows XP. Simple setup." Cons "Some excess desktop and file clutter; glitches with legacy apps running under Windows XP. Setting up Windows networking is more involved than with VMWare Fusion. Costs more than Fusion." "Very slightly slower than Parallels Desktop in some functions." Bottom Line "One of two superb OS X apps (the other is VMware Fusion) that let you run Windows or Linux in tight integration with OS X itself." "One of two superb OS X apps (the other is Parallels Desktop) that let you run Windows or Linux in tight integration with OS X itself." Both main vendors of hypervisors continue to release new version at about the same time in the year. 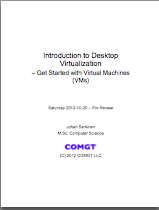 Ready-to-use virtual machines (operating system, applications, ... on virtual disk for immediate use with hypervisor(s)). Simply download, unpack (these are most often big things and are distributed in some compressed format, like zip) and open with the hypervisor application. Chrysaor.info - a good source for VMware-ready images for Debian, OpenBSD, and Ubuntu distros. it's actually a folder. Use Show Package Content to view contents. but none immediately accepted this format. Need to further research converting .VHD-files to other format(s). (The above immediately mounts on a Mac OS X system without any additional software. Open Virtualization Format (OVF) command line interface (CLI) tool by VMware, for for importing and exporting OVF packages. The tool is free and avaialable for Mac, Windows, and Linux. Again, a CLI- and not GUI- tool. Trying on Mac, repeatedly get error "failed to open disk"
The Windows XP virtual machine we're frequently using for digital forensics / InfoSec (mostly tools) is 45 GB. Recommended hard disk space for installing Windows 7 is 20 GB. One BackTrack 4 installation we have occupies 9.3 GB. A standard Ubuntu 10.10 Desktop installation, once started, occupies around 4.3 GB. And just opening the virtual machine changes files within and thus marks the virtual hard disk file and related files for a new backup. So, what solutions are there? Exclude backups of (specific) virtual machines. If VMs are only for test and play and you don't care about loosing some work. (Host OS). Create separate backup schedules for virtual machines. (Host OS). Different time schedules and use of different backup storage areas. Set up backup handling from within the virtual machine itself (Guest Os). This can be quite a lot of additional work for the average user. Use specific software for backups of virtual machines - this is a relatively new area and products are still evolving. Many are only focusing on data centers (with corresponding costs involved) and we haven't seen any good and easy-to-use solutions for desktop users yet (Jan 2011). For most desktop users, we recommend either option 1 or 2. You don't want to backup your VMs to your online storage, which for every minor change could take hours - if not days - to execute. As enterprises move towards virtualizing more of their servers and data center infrastructure, the security technologies that are plentiful and commonplace in the physical world become few and far between. While few direct attacks on virtual machines have been observed, it is still good security practice to protect VMs from potential vulnerabilities that exist only in the virtualized world. For example, physical firewalls aren't designed to inspect and filter the vast amount of traffic originating from a hypervisor running 10 virtualized servers. And because VMs can start, stop, and move from hypervisor to hypervisor at the click of a button, protective features have to be able to handle these movements and activities with ease. Finally, few hypervisors have the access controls that even the most basic file server has: once someone can gain access to the hypervisor, they can control all of the VMs that are housed there. In response to these concerns, a number of new vendors have created virtualization security tools. And the pace of mergers and acquisitions has picked up as the established vendors try to augment their offerings and integrate products. For example, VMware purchased Blue Lane Technologies and incorporated Blue Lane's software into its vShield product line. Juniper Networks purchased Altor Networks Virtual Firewall and is integrating Altor into its line of firewalls and management software. And Third Brigade is now part of Trend Micro's Deep Security line. Complexity is the enemy of security, and today's virtualized infrastructures are anything but simple. If your security policies haven't kept up, it's time to reassess. InformationWeek's special digital supplement can help. 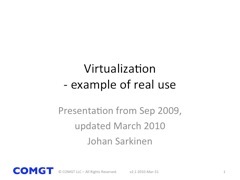 Virtualization Security: Virtualized servers are still just servers. Stick with what you know. InformationWeek Analytics' Virtualization Security Survey analysis provides low-cost steps to keep data safe. Hypervisor Security: New hypervisor hardening options. Used to be a full-blown hypervisor that supported multiple different guest operating systems but support and functionality has declined ever since Microsoft bought the product from Connectix in 2003. After years of use we no longer bother with Virtual PC (Windows Virtual PC) but focus on the big three above (Parallels, VMware, and VirtualBox).